The fire shown in this photo has been ravishing our community. Over 25,000 acres burned. 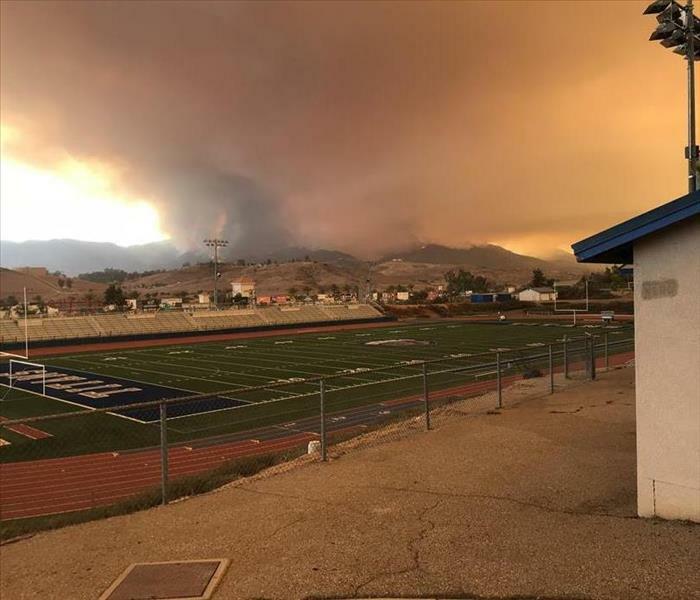 The surrounding neighborhoods were evacuated to the local high school and received care from the American Red Cross and SERVPRO of Lake Elsinore. This house was completely flooded. The homeowner was displaced for 3 months due to the damage. The mitigation potion took a week to complete. The rebuild took 2 and a half months. This house had a leak in the roof due to a wind storm. Luckily they caught it quickly and can have it repaired before the next storm! The team worked hard to get this tarp up. This is the demolition done to a part of the living room after a water loss. The home was flooded through the kitchen, living room and two bedrooms and had all the flooring removed. When performing a mold job, the guys will put up a containment unit, like this one, so that the mold isn't spread anywhere else during the cleaning, removal and air scrubbing. These are a few of our guys modeling PPE for our enjoyment and testing out their new masks. SERVPRO is all about safety first and making sure that everyone is protected while in the field! This home had a large fire towards the front. The rest of the house suffered from pretty extensive soot damage. This is the bathroom showing part of the tub, walls and fireplace all with soot. This home caught fire and caused pretty heavy damage to the front of the home. As you can see, the roof of the garage doesn't exist anymore. We had to brace the walls and create a temporary roof so the structure didn't collapse in on itself. 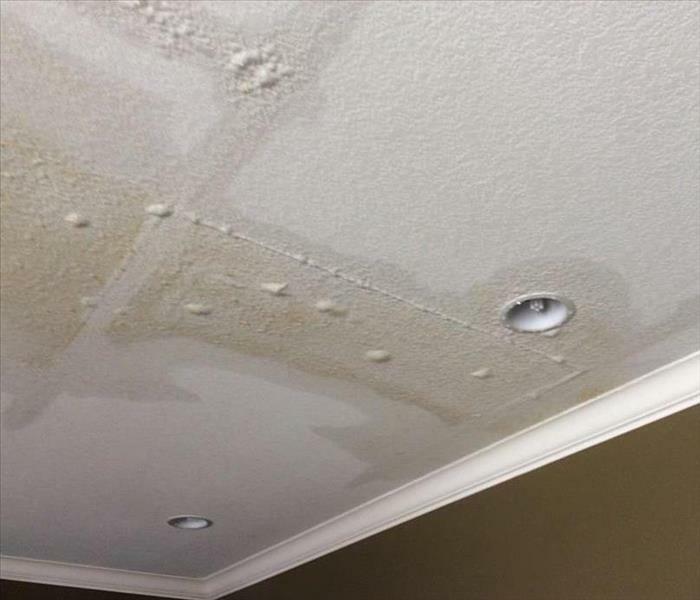 This is a job that had minor water damage throughout their entire ceiling. The tiles, and insulation were removed to be able to find exactly where the leak was coming from. This is a water loss that occurred at a local Boys and Girls Club. The entire front entry way and two of the classrooms were affected. We removed the damaged materials and proceeded to dry the area. 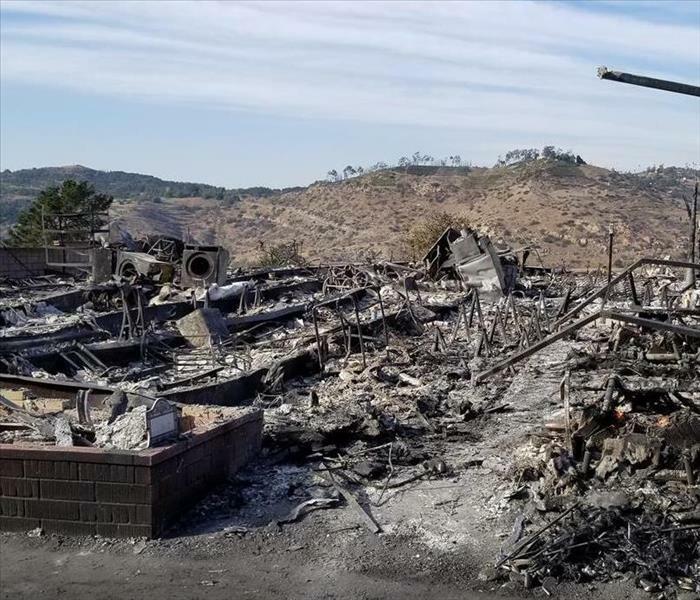 The high winds in Southern California, known as Santa Ana Winds, can cause severe damage when they kick up debris or blow just wrong on the roof. This roof was damaged due to high winds in the area. The fire damage in this home was caused by a larger area fire. Luckily, the most damage was done in the garage area of the home. While the rest of the home suffered smoke damage the garage was destroyed. This was an unfortunate event in the Fallbrook area. Southern California is known for it's wildfires. This fire took out many homes in this neighborhood. We were able to help clear much of the debris and get them on the road to recovery. 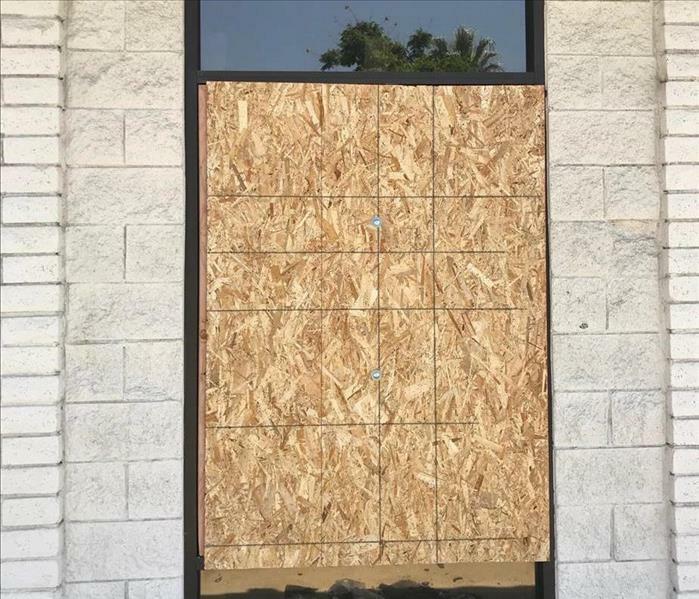 This is the board-up performed by our crew after a storm blew debris into this window and damaged it. We took out the remaining glass and boarded the window up until a new window could be installed. This photo shows water coming in through the ceiling from a loss upstairs. The ceiling is leaking into the kitchen and living areas of this home. The leak was contained and we were able to get the mitigation done quickly! This photo shows the water damage under the partially removed carpet in an apartment. The water came in under the walls from a different area in the house. 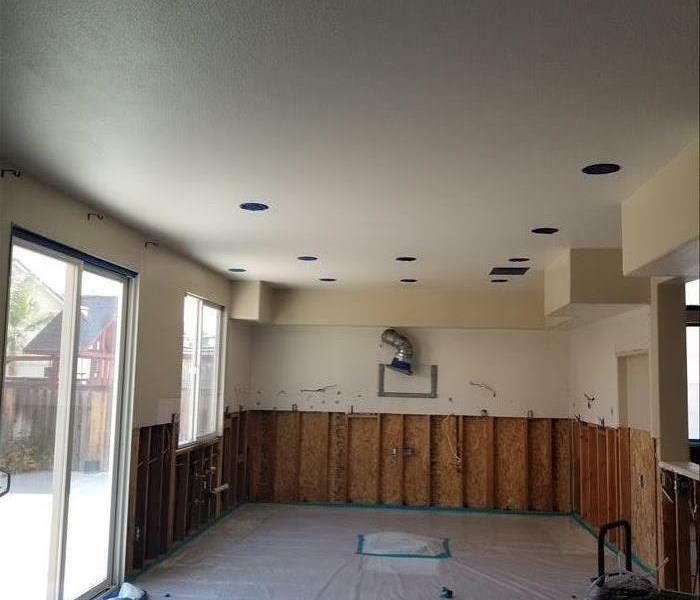 The carpet and drywall were removed to fully dry everything properly. 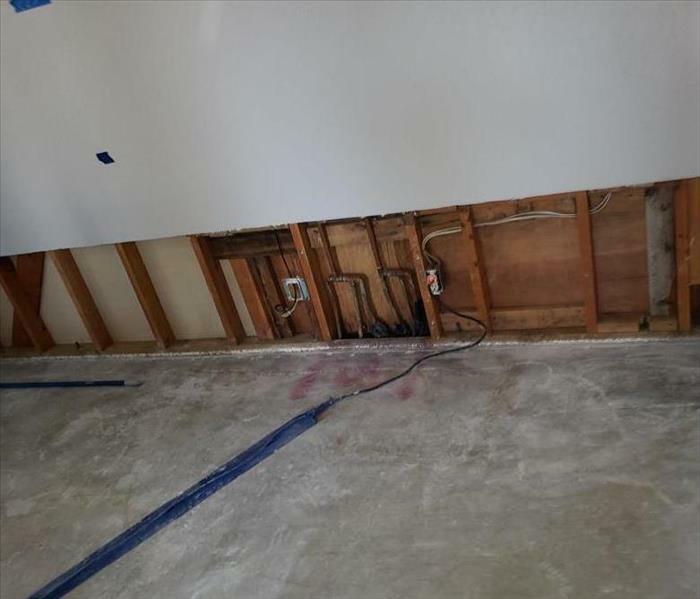 This photo shows water damage and mold growing under a kitchen sink. 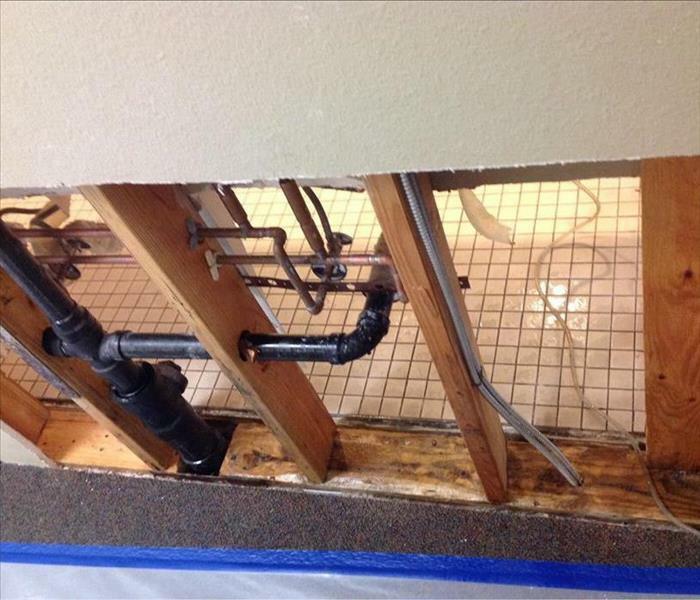 The homeowners didn't notice the slow leak until the board caved in due to mold and rot. This is mold that was found at an elementary school. The school called us as soon as they found it so we could perform mold remediation and get the kids back into the classroom as quickly as possible! This is the after pics of a mold job performed by SERVPRO of Lake Elsinore. The room was contained and the affected areas were dealt with accordingly. The customers were very satisfied. This house fire started in the garage but covered most of the home in damage and soot. As you can see in this photo, the upstairs roof was pretty severely damaged. The local Home Depot suffered a water loss and called SERVPRO of Lake Elsinore/Menifee/Perris to extract the water and dry the area. The whole store was affected but they were very pleased with how quickly we got them operational again! This is a mold remediation job for a commercial bathroom. The wall was removed which revealed a large amount of mold. The process for removal took several days but the customer was very pleased with the end result. 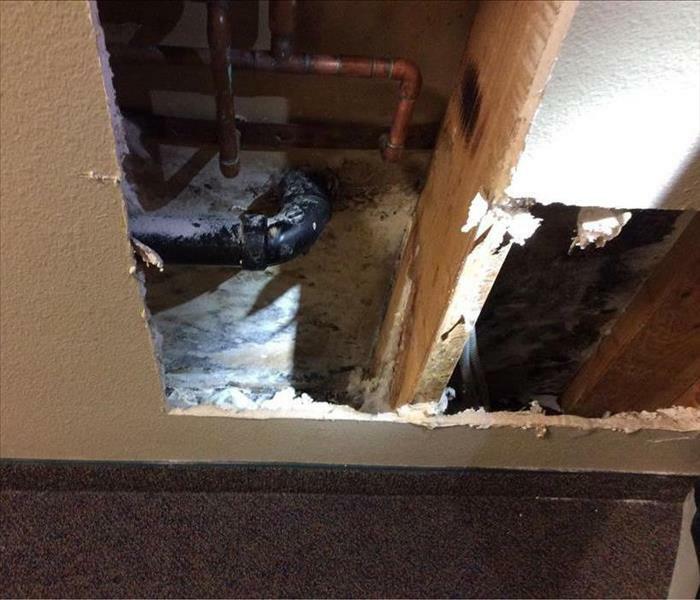 This loss was caused by a slow water leak in the bathroom of a commercial building that lead to a mold issue. The customers called us in for the mitigation and the mold remediation. A toilet overflowed in this bathroom in a commercial building. 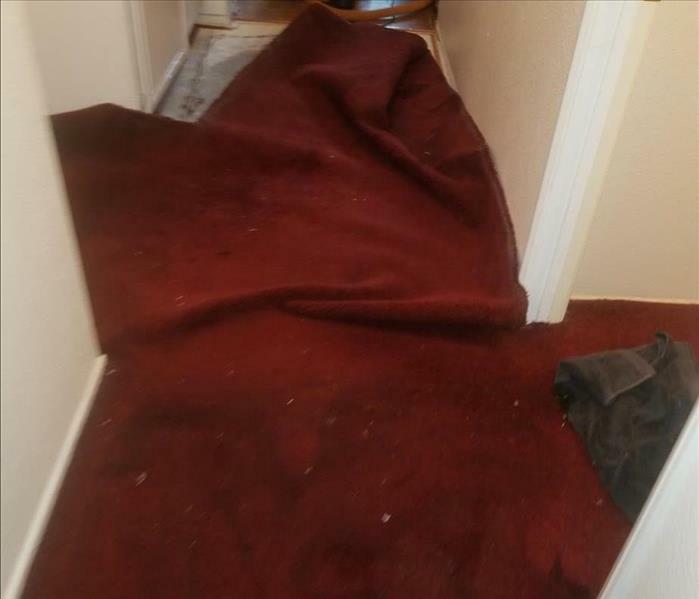 The water was extracted and the carpets removed due to the category of loss. The company was very pleased with the speedy service provided by their local SERVPRO! The loss was caused by a back up of the toilets that reached most of the floor in this school district building. 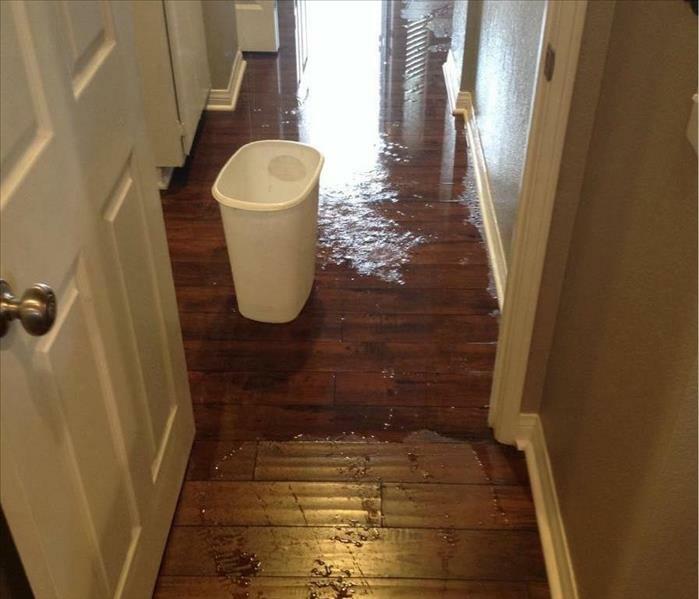 SERVPRO of Lake Elsinore/Menifee/Perris was on site and starting the job within 30 minutes of the call! The front entry of this home sustained soot damage and water damage due to an explosion in the garage. The fire was contained mostly to the garage and kitchen. Thankfully, the family is safe. The damage to this home was caused by a car exploding in the garage. Thankfully, no one was in the home when it happened. The kitchen had minor damage to some of the cabinets. The fire damage to this home was caused by a vehicle exploding in the garage. The entire garage was demolished and the inside had massive smoke damage. Thankfully, no one was harmed during this event. 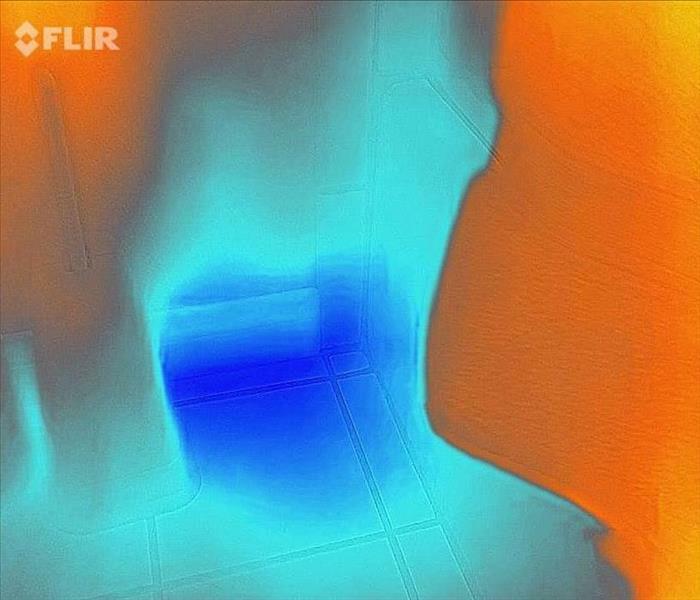 The main source of loss in this home was due to water in the bathroom. This is one of the many tools that SERVPRO uses to detect where water is still located. This is the wall in the bathroom, with all the blue showing us where it is still wet behind the walls and floors. Due to a water loss in the home, the team had to remove all the carpet in the hallways to make sure the environment would dry properly. The loss encompassed, the bathroom and two bedrooms as well.